We saw it coming from last week. A swell forecast to kick in Thursday accompanied with moderate to strong SSW wind. This combo sets up a very clean wave at Coquina Beach for excellent wavesailing conditions! Yesterday, the forecast rung true and I was there to catch it. I cut out of work a few hours early to make the session and when I rolled into Coquina and eyed the break from the dune line, well this was the playground I saw. A fun, easy lineup with long rights and solid peaks! I was rigged quickly on the 92 Quatro Twin and Mutant 5.1. The first wave I had was quite nice with a hit at the peak and floater aerial to open the session. From there, it was wave after wave, and though the wind was fairly light, it was manageable, though I was into the conveyor belt of beach walks to stay in the area of the break as it was difficult to stay upwind. No worries though, simply ride a few, come into the beach, walk upwind and relaunch. As seen in the photo, the shorebreak at this section of beach was minimal and it was quite easy to get out. Water was perfect with clean, warm, trunks only conditions and hanging out in the zone to await a passing set, if I was down, was actually quite enjoyable. All in all an awesome Thursday afternoon/early evening session on the standard kit! Fun Coqunia Wave Sesh Yesterday! Yesterday, there was a solid swell in the water and S wind turned on in the afternoon. A key spot of interest was Coquina Beach. 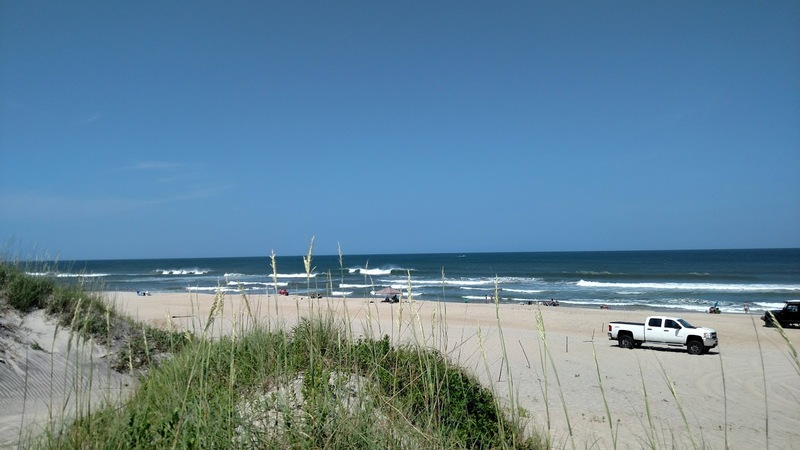 Coquina is a rarely windsurfed beach as it is located just south of the Nags Head town line; however, the orientation of the island in the area provides excellent side-off conditions for due S wind. Where it can be choppy/side-on south of Oregon Inlet, Coquina is perfectly groomed with long lines and solid conditions. Yesterday, we had that combo and although the swell was fleeting, there were some fun head high sets between the periods of lake-like conditions for ease of getting out. Pro Japanese wavesailor Kana Suzuki and her Dad joined me for the action at Coquina. Wind speed had dipped; however with a floaty ride there was no problem getting into the lineup. I rode the trusty Sealion Pro and caught a quick session as Kana’s Mom kept an eye on my two little dudes (BIG thx!) while they enjoyed some game time on the Android (earlier when I was scouting, they had a ton of fun playing among the dunes and beach at Coquina). Kana and her Dad caught some great rides on some nice surf conditions, and I enjoyed a number of fun rides myself on the Lion. All in all, a great session for a Sunday afternoon/early evening! Here are a few Bambuser reports I shot while scouting. If I was solo (no dudes), I would have been out there as soon as I saw the lineup! Yet More Rmp 30 Action Yesterday! Ramp 30 action continues with a early evening session for the crew in Avon yesterday! Bonus too is the forecast is ripe yet again today!